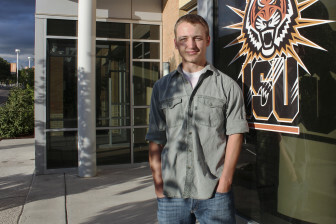 POCATELLO, Idaho — Derek Sommer carries a concealed handgun almost everywhere he goes these days, including onto the campus of Idaho State University — an illegal act until recently. Under an Idaho law that took effect July 1, nearly 3,000 Idaho residents with enhanced concealed carry permits — people like Sommer — can bring their guns on college campuses. Sommer no longer leaves his gun at home or in his car’s locked glove compartment. Idaho became the seventh state to allow “campus carry” in a movement gaining traction across the country, despite the often strenuous opposition of other students, faculty and campus administrators. Spurred by recent high-profile campus shootings, grassroots groups like Students for Concealed Carry (SCC) are pushing for the right to carry weapons on campus, sometimes with the backing of larger gun rights groups like the National Rifle Association. For Sommer, 23, a computerized machining student who founded Idaho State’s SCC chapter, carrying his handgun means protection for himself, his wife McKinley, and their 7-month-old daughter, Andi. Derek Sommer, 23, an Idaho State University student, used to leave his gun locked in his car when he went to class. A new law allows him to carry his handgun concealed while he is on campus. For others, like Boise State University student Angel Hernandez, the new law means less focus on learning and more on worrying about who’s packing a gun on campus. “I went to Boise State to get an education; I didn’t go to Boise to go to a gun show,” he said. Opponents of campus carry laws have saw mixed success of late. Arkansans Against Guns on Campus got state lawmakers to exclude students from a law letting faculty and staff bring concealed guns on campus if their college grants permission. Attempts to start a Colorado referendum to end campus carry there ended in failure. Groups like SCC, meanwhile, have active chapters in at least 30 states, mobilizing as many as 30,000 students and faculty to support laws and court cases favorable to the cause, said group spokesman Kurt Mueller. The group occasionally makes local headlines when members gather to wear empty holsters to promote campus carry — from Washington state to Michigan to Florida. It operates with little funding, relying instead on volunteers and social media for recruitment and chapter operations, Mueller said. Concealed weapons, except for law enforcement officials, are banned on the University of Iowa, Iowa State University and University of Northern Iowa. Legislative efforts to overturn the ban have failed. A News21 analysis of on-campus shootings found 87 of them, or 60 percent, have happened in the past decade. Campus carry supporters nationwide said in interviews that the increase in shootings partly influenced their desire to bring concealed guns on campus. SCC formed after the 2007 Virginia Tech shooting, the deadliest mass shooting in U.S. history. Mueller argues an armed student could’ve stopped the shooter without waiting for police to arrive. 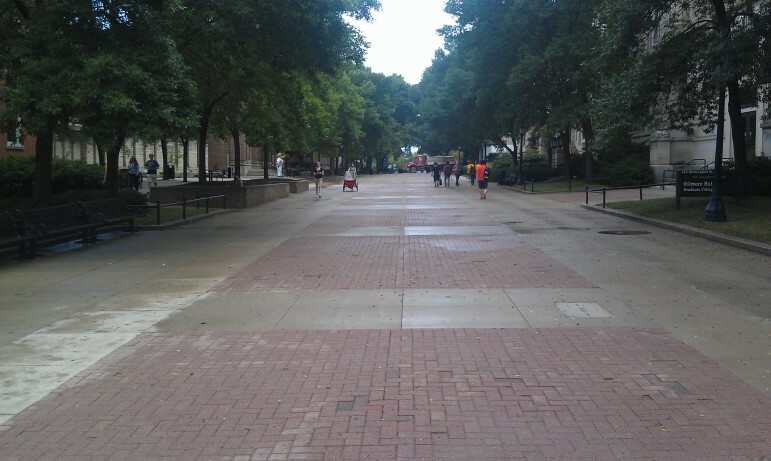 The University of Iowa’s T. Anne Cleary Walkway is named after a victim in the university’s worst single day of on-campus violence, Nov. 1, 1991. That Friday afternoon UI physics doctoral graduate Gang Lu killed fellow doctoral graduate Linhua Shan and physics and astronomy professors Dwight Nicholson, Christoph Goertz and Robert Smith at Van Allen Hall before going to Jessup Hall, where he fatally shot Cleary and wounded then-student Miya Rodolfo-Sioson before killing himself. Rodolfo-Sioson lived the rest of her life as a quadraplegic until dying of breast cancer in 2008. 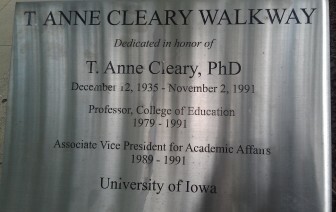 A sign marks the University of Iowa’s T. Anne Cleary Walkway. Campus carry supporters point to the legal doctrine of preemption, which says only the state legislature can regulate guns in the state. No other government in the state, such as cities and counties, can make gun rules. Many states exempt K-12 schools and some public buildings from concealed carry of guns. Oregon, Utah, Colorado, Kansas, Mississippi and Wisconsin — and now Idaho — have laws on the books that allow students to conceal weapons on campus. 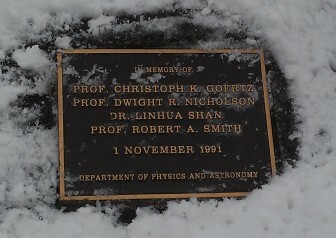 A plaque and wreath during a winter day at the base of a tree planted as a memorial to members of the University of Iowa physics department killed in the Nov. 1, 1991, mass shooting on the UI campus. The first state to finalize campus carry was Utah in 2006. University of Utah continued banning guns on campus despite the state’s 2004 preemption law. Two years after the law passed, a lawsuit against then-state Attorney General Mark L. Shurtleff led to colleges allowing concealed guns. A 2011 lawsuit by a division of the Oregon Firearms Federation led to a state court striking the Oregon state education board’s ban against guns on campuses. The victories are not complete. As in other campus carry states, Oregon universities insist they can limit guns in buildings, and the Oregon state board bans guns in event centers, classrooms and dorms. In Utah, students may ask not to live with gun owners in dorms, and universities can ban guns from certain meeting rooms. Kansas’ 2013 campus carry law included an optional four-year delay before licensees could bring concealed guns on campus. Arkansas’ law allowing only faculty and staff to carry requires colleges annually renew any on-campus bans. The laws on campus carry in other states vary, from letting students store guns in their cars to leaving policy decisions to the schools. Colorado courts sided with SCC in 2010 and 2012, ruling the state’s public universities and colleges must allow concealed weapons permit holders to bring guns on campus. The courts said college gun bans violated a 2003 state law giving the legislature sole gun regulation control. Colorado colleges still regulate guns in dorms, dining halls and event centers. University of Colorado, Boulder, designated dorm space for gun owners, but no students have requested it, said campus spokesman Bronson Hilliard. In Colorado, concealed carry licensees must be at least 21. SCC’s focus next year is Texas, Mueller said. As of September, students could store guns in cars on campus. The group plans to have members write and call state lawmakers to demand more places on campus that allow concealed guns. The law shouldn’t block licensed gun owners — including college students — from carrying on campuses, Mueller said. In some places, crossing the street could mean a law-abiding gun owner is now on campus and breaking the law. Encouraging students to own guns raises questions for some firearms researchers. Crime research consultant Tom Gabor said he believes letting students possess guns in more places is too risky and goes against dozens of public health and criminal justice studies. People in the 18- to 24-year-old age range are more impulsive and at greater risk for suicide, said Gabor, who taught criminology at the University of Ottawa for 30 years and studied firearms for 20 years. Gabor cites statistics from a 1986 New England Journal of Medicine article — an article contested by gun rights groups — that said for every one time someone shoots and kills another in a home in self-defense, about 43 other home gun deaths result from suicide, murder or accident. “People will thwart an attacker, but I imagine many more reports of death and disabling injuries,” he said. He sees campus carry as a gun industry move to gain customers. Hammer, a former NRA president and the organization’s longtime lobbyist in Florida, said that NRA will use the state’s preemption law to push state legislators to authorize concealed carry on campuses. “Students can’t (carry) right now, but we’re going to fix that,” said Hammer, one of 76 NRA board members. On July 30, the Florida Carry lobby lost its suit against the University of Florida over the university’s guns-in-cars policy and whether colleges must let guns in campus-owned housing statewide. The lobby will appeal, according to its website. Florida Carry, which is unrelated to SCC, has a reputation for using the preemption law to successfully sue cities, counties and colleges over their gun bans. Last year, the lobby successfully sued the University of North Florida to get guns allowed in cars on college grounds. The NRA led the campus carry effort in Idaho, where the NRA state lobbyist was a regular at bill hearings. Though the NRA has been a major player in Idaho and Florida, it usually takes a supporting role on campus carry, NRA board member and former lobbyist Todd Rathner said. The NRA’s press office declined to comment for this story. SCC and a grassroots group called Ohioans for Concealed Carry cited Ohio’s pre-emption law in a July lawsuit against Ohio State University that seeks to allow campus carry there. The trial is expected to start next year. SCC has also threatened to sue Georgia after a letter from the state attorney general’s office declared campus carry still illegal, SCC Southeast Director Robert Eagar said. The groups say campus carry is allowed by Georgia’s Safe Carry Protection Act, which critics have called “guns everywhere.” The law, which took effect July 1, allows permit holders to bring concealed guns into K-12 schools, bars, churches and more. 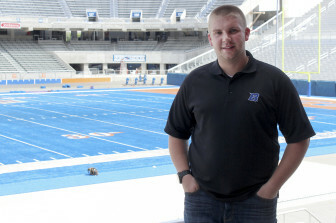 For Hernandez, the Boise State student, campus is no place for guns. He is a member of the student government who joined other Idaho students to protest the campus carry law. The students and other Idaho activists received guidance from Andy Pelosi, who challenges campus carry on a national level. Pelosi, who is not related to House Minority Leader Nancy Pelosi, started the anti-campus carry group GunFreeKids.org in 2008. A series of campus carry bills following Virginia Tech and the 2008 Northern Illinois University shootings — in which 27-year-old former student Stephen Kazmierczak killed five people and wounded 18 — caused Pelosi to focus on higher education. His group focused on Idaho and Georgia this past legislative year, he said. Next year, he expects to help coordinate resistance to campus carry in Texas. Colleges that side with Pelosi fear on-campus gun theft, threats with guns and accidental shootings, he said. In Idaho, students and faculty who protested when Gov. C. L. “Butch” Otter signed campus carry into law, said lawmakers ignored them and listened instead to lobbyists and Idahoans who don’t work and live on campus. Boise State student-body President Bryan Vlok stands on the roof of the business college where he takes classes. Vlok helped organize the student protest against concealed carry on Idaho campuses. Boise State student body President Bryan Vlok said he faced an uphill battle fighting campus carry. Still determining what the law means for Idaho students, he joked about putting bulletproof vests in the student government budget. Student leaders organized a rally at the state Capitol, arranged automated phone calls across the state and met with the governor’s staff to say students overwhelmingly fear campus carry. The new law only applies to holders of enhanced concealed carry permits, not regular permit holders, who require less training and can be 18 to 21 years old. But Vlok believes the requirements to get the enhanced concealed carry permit are not enough to make someone responsible or accurate. Created last year, the license requires applicants take an eight-hour class on gun use and fire 98 rounds in front of an instructor. Ross Perkins, a Boise State associate professor in educational technology, criticized the campus carry movement in an opinion piece for a local newspaper. He recalled witnessing the aftermath of the shooting at Virginia Tech, where he worked and studied for about nine years. 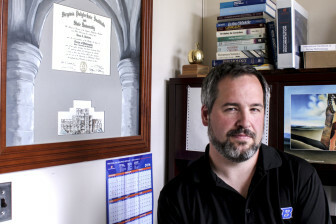 Boise State University associate professor Ross Perkins poses next to his doctorate diploma from Virginia Tech. The campus carry opponent worked at the college at the time of the 2007 mass shooting. Perkins can picture the school’s grounds that day. He felt the heavy wind, heard the sirens and watched as responders rushed the first victims out of Norris Hall. He was 38 at the time. About once a year, he said, he visits the Virginia Tech memorial at night, when it’s quiet. He walks the semicircle of Hokie Stones, rocks mined from Blacksburg quarries, reading the names of the 32 people murdered. He tells each person his or her life mattered. But supporters of campus carry say the Idaho opposition is a vocal minority led by Boise State administrators. Idaho state Rep. Judy Boyle, a Republican and one of the law’s sponsors, hopes to amend it to stop the university from exempting the student union building. Now that Idaho State student Derek Sommer has that ability, he said he wonders if he could use his weapon should someone attack him. This report is part of a project on gun rights and regulations in America produced by the Carnegie-Knight News21 program. Carmen Forman an Ethics and Excellence in Journalism Foundation News21 Fellow. Kate Murphy, Kelsey Jukam and Kristen Hwang contributed to this story. Kristen Hwang is the Donald W. Reynolds Foundation Business Journalism News21 Fellow. Twenty months after the mass shooting at Sandy Hook Elementary School in Newtown, Connecticut, some would say little has changed when it comes to guns in America. Others would say everything has. A special News21 report explains. Your story missed something – an Idaho State University chemistry professor just accidentally shot himself in the foot during class. No students were hurt, this time. He was carrying legally with their brand new law. Six days is all it took for this to happen. First shooting – accidental or otherwise – at this school. it would a privilege granted by the government. Please study your Constitution and Bill of Rights.